Pupils at Our Lady’s Girls Primary School in North Belfast have had anything but a bad hair day by raising £250 for WaterAid! Having been inspired by a recent visit by the Waterbus, NI Water’s travelling classroom, to their school, Year 5 pupils at Our Lady’s decided to do their bit to help the international charity provide clean drinking water to the world’s poorest communities by organising a ‘Funky Hair Day’ which raised £250 in sponsorship money for WaterAid! 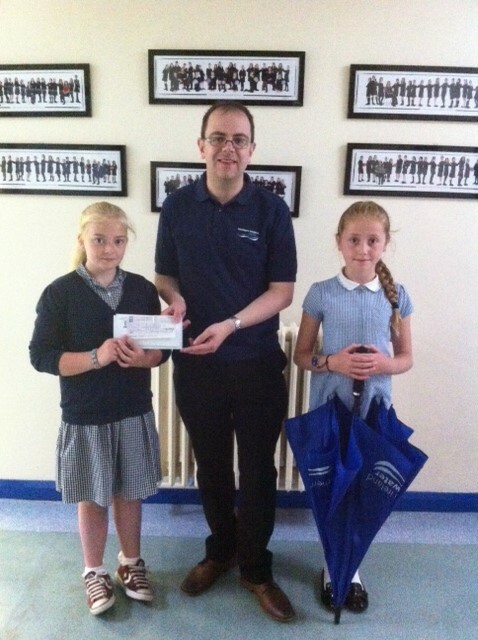 Graeme Smyth of NI Water, who recently visited the school to receive the donation on WaterAid’s behalf, said: ‘‘We were delighted by the generosity and desire to help displayed by pupils at Our Lady’s Girl’s Primary School. It means a lot to us that they were inspired by the Waterbus to help in this way, and we are very grateful to them for this very generous donation. I wish I’d been here to see some of the ‘funky’ hairstyles that helped raise it! ‘‘It is all too easy for us in Northern Ireland to take our fresh water supplies for granted, but for 650 million people around the world, living without a reliable and safe source of water is the reality. What’s more, 2.3 billion people – one third of the global population – do not have safe access to a toilet. This is something which should concern everyone and raising awareness of the preciousness of water and the role of WaterAid will help change that situation for the better.